As a predominately veggie household we buy a lot of meat free food. We do mostly buy the bits to make our own, but it's more realistic to review the pre made things we get for convenience meals. 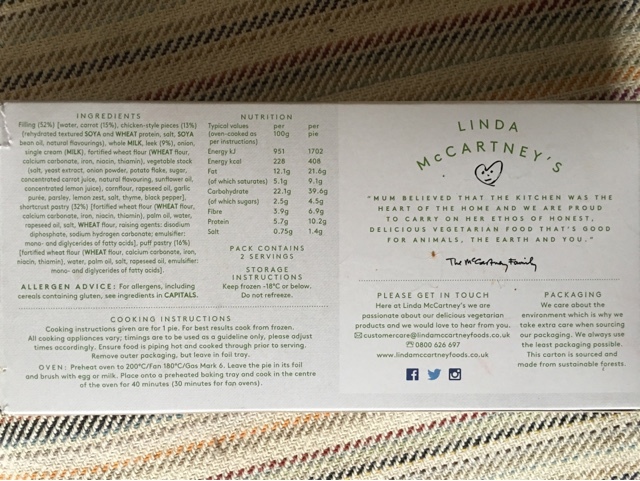 We tend to avoid the Linda McCartney brand purely because their goal seems to be to make things that can trick meat eaters into eating non meat products. I don't understand this because they rarely meet up to the expectations. My partner dislikes them because she doesn't want to eat meat - so why would she get something pretending to be meat. These pies looked like a good opportunity to see what was the current state of the brand. No mistake - these look good. Well photographed and with nice bright, clear modern packaging I'm happy to try them. Deliciously comforting is a very strange phrase that sounds like something Montgomery Burns from The Simpsons might say. A bit freaky. As these look suspiciously meaty and as such will sit at the back of the food queue I sneak them onto the menu one evening when I'm staring food while my partner is out. They take a long time to cook from frozen but at least have the decency to smell great while doing so. For those that are interested here are the vital statistics. Comparatively healthy compared to the meat versions. First up the pastry is good. Not PieMinister good, and not like the pub pies I'd had the night before in the Old Joint Stock Birmingham, but this isn't cheap stuff and you'd not know that it was veggie. The sauce is creamy enough, and the veggie bits are good. The fake chicken is for me where it falls down. This soy protein is a little rubbery for my liking, and it's not got either texture or flavour that it could. You are manufacturing the soy, and sealing it in its cooking environment. Why not mix the herbs in with it to both improve the flavour and the texture? I get that this is not what happens with real chicken, but I guarantee if the top chefs could breed animals where the flavour was baked in then they would. It baffles me that some brands choose to accept the artificial limitations of meat and aim to match those. I did enjoy this pie, I could have done more veggies for a side dish but didn't think to. I think if we'd have been presented with a chunky veg instead of the soy (or the soy meatball idea above) then I'd be coming back for more. 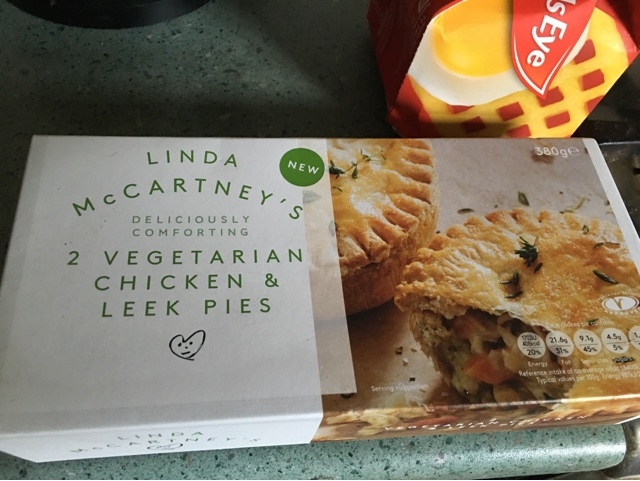 As it stands I'll just get his and hers pies from another range where there is more going on inside. It was however better than I'd initially feared or remembered so the second frozen parcel shall wait until I can give it a fair try too.